Keep at it Lorna! I’ve had a few red spots on the tree this year (which I’m removing as soon as I see them) but it’s not as heavily infected as last year, so I think I’m winning the battle. I live in north west, my pear tree has had rust spots for the last two years, it’s only three years old, never had any fruit yet, have removed the leaves that are infected, and was hoping this year might be different, but have noticed, I’ve a few leaves with tiny bit of rust on, do I persevere , or just get rid and start again, advice would be greatly appreciated. Hi Vicky, I would persevere with it for a while longer, removing the leaves as soon as you see signs of the disease. I have certainly noticed fewer spots the last 2 years by doing this, but it hasn’t gone away completely. Unfortunately, even if you break the cycle between your pear tree and the juniper tree that hosts the disease over the winter, there may be another pear tree in the area that keeps infecting the juniper, so you’ll still keep getting the disease. Although I haven’t got rid of it completely, the pear rust doesn’t seem to have affected my yield of pears the last 2 years (my pear tree is only about 6 years old). I had a bumper crop last year and it is heavy with young pears again this year. So your lack of pears may be down to something else. Is the tree on good fertile soil; do you feed it? My apple tree is on heavy clay soil and does not produce much fruit at all, so my mission is to improve the nutrients and see if it starts to yield. It’s worth a try to see if it helps. The RHS has good advice on feeding fruit trees (and mulching in late spring/autumn). Or have you overpruned it? Young fruit trees don’t need much pruning. Again, the RHS has good advice on winter pruning of apple and pear trees. The links are on my blog at http://15minutesofgreen.com/final-winter-tasks/, where I have a section on winter fruit tree care. Finally, is your pear tree a self-fertile variety? If not, then you’ll need another variety of pear tree to cross-pollinate it with in order for it to set fruit. I wouldn’t give up on it just yet, but a try a few different things, and give it some TLC through the winter to see if that helps. Let me know how you get on, and if you come across any tips to get rid of the pear rust completely, I’m all ears. Good luck! Our pear tree is I would think over 60 years old . 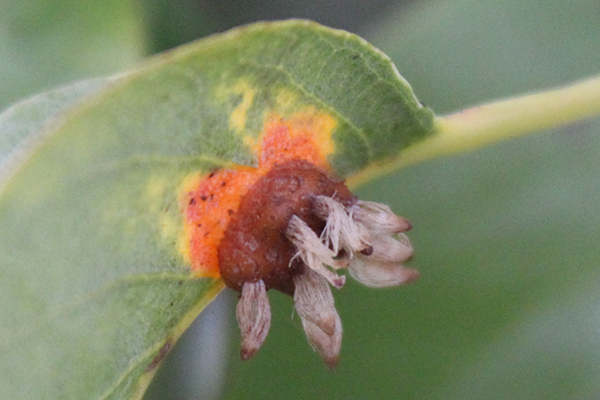 This is the worst infection of tree rust in the forty years we have lived here just outside London. We allotment in Bracknell, Berkshire. Pear rust appeared on our 2-year old Williams tree on the allotment. We only noticed it today as the beautiful pears had mysteriously disappeared too. We have picked all the infected leaves off both this and another small pear and one apple which are all growing together along an espalier. I hope it helps. Sad to say I have had the problem again this year and I haven’t been quick enough to remove the leaves, so I’ll probably have it next year too. On the up side, I still got a fair few pears though. 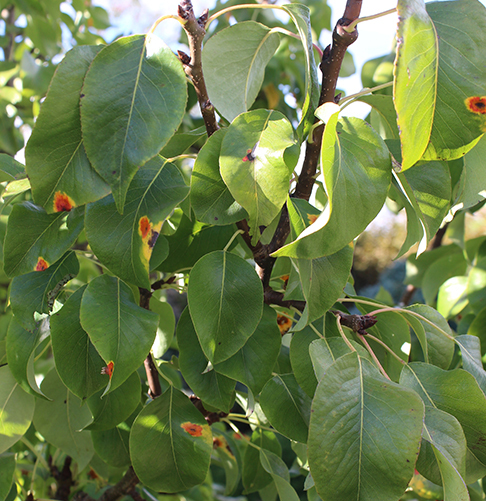 Hi, I have pear rust on my tree at my allotment and my allotment neighbour has the same problem. 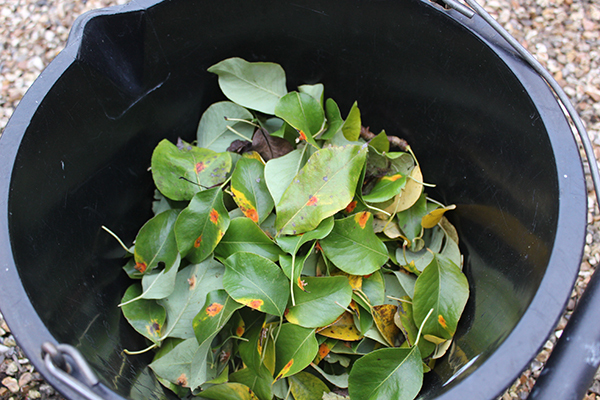 We have been removing the infected leaves but it is so bad that would mean pretty much removing all of them on mine. We are trying to coordinate our efforts but we are starting to wonder if there are other hosts nearby. Does anyone know how far can the airborne spores travel? I don’t know the answer to that but would love to know the answer if anyone else out there knows ….? Good luck with your efforts. 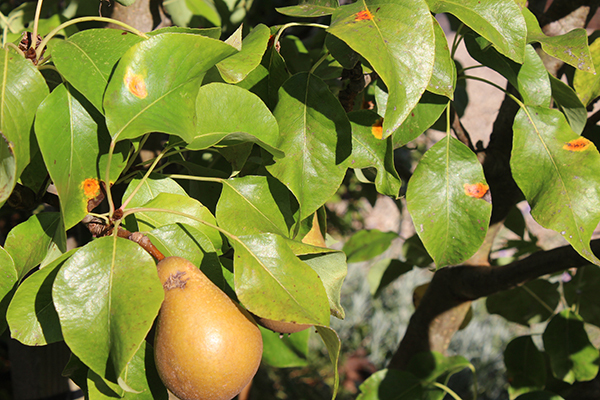 Even if you don’t get rid of the pear rust your pears should be ok. Thanks for putting this information online I had literally no idea what this is and didn’t notice the infection until it was well established. Will remove the leaves shortly now I know how to deal with it. I’m surprised there are no available fungicides we can use; hope it doesn’t affect next year’s crop. Big thank you. Sad to say it’s back on my pear tree with a vengeance this year, so I guess I didn’t remove the leaves soon enough last year. Hope you have more success than me. Do let me know!